As the temperature rises into the triple digits, salads will be eaten at least one meal a day at my home. This wonderful salad was inspired by actress Tiffani Thiessen, who recently had a special on the Food Network. Surprisingly, I only made two small changes to her recipe. I used sliced almonds, instead of Marcona almonds, and I omitted the white truffle oil, used for drizzling. The dish is a mixture of flavors and textures. 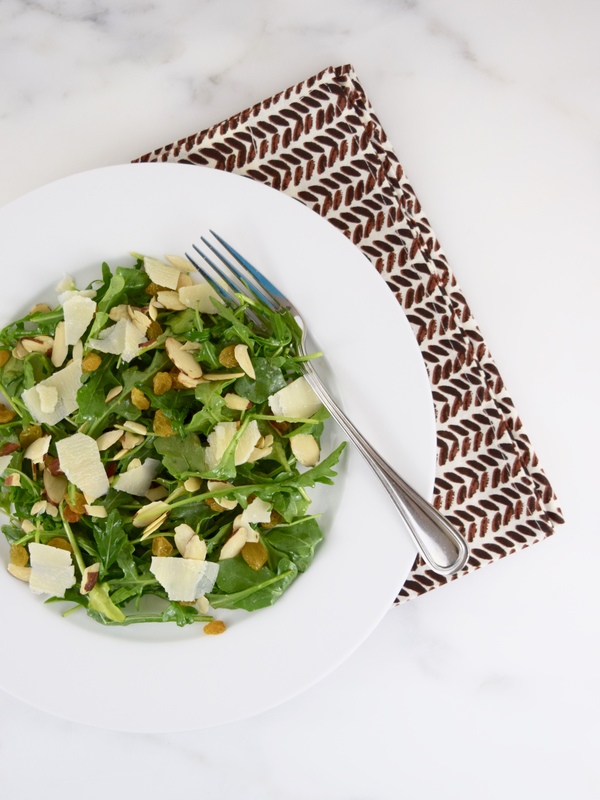 You have the peppery taste of the arugula, the crunchiness from the roasted sliced almonds, the sweetness from the golden raisins and the saltiness from the Parmesan cheese. This is such a delicious salad, while being so healthy and satisfying! Using a large bowl, whisk together lemon juice, mustard and olive oil. Add salt and pepper to taste. 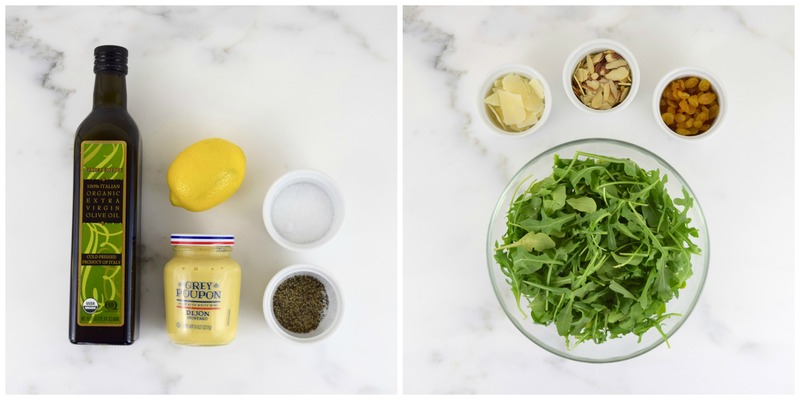 Add the arugula, almonds and raisins and gently toss together. Transfer to serving platter and top with the Parmesan cheese. Serves 4. Great salad, I think the arugula and almonds are a wonderful combination. Thanks for commenting on my latest blog. Have a great weekend! Wonderful! 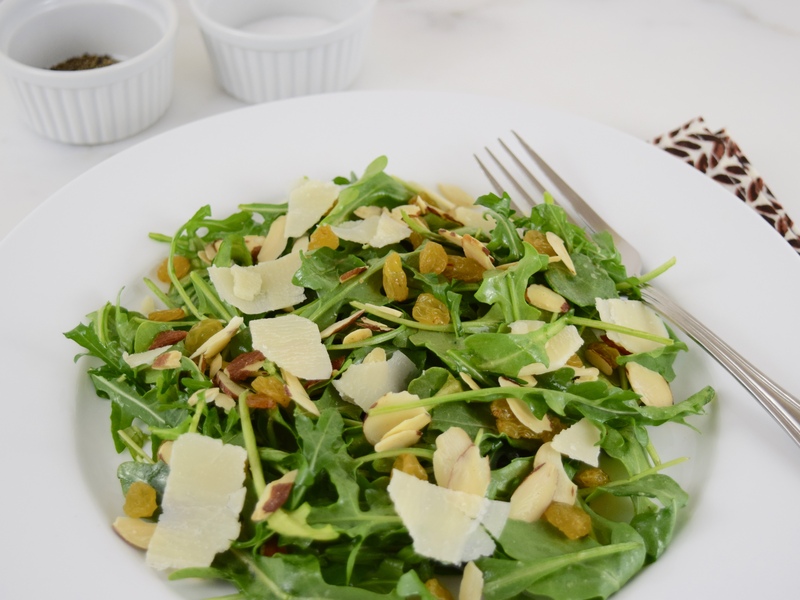 Arugula & marcona almonds are two of my absolute favorite foods!! I am sure that I would have loved your version with sliced almonds too. Really fresh & lovely!